Cromartie intercepted five passes in college and returned 43 kickoffs for a 23.3-yard average, but in 2005, his last year, he missed the season due to a knee injury suffered during a summer workout. 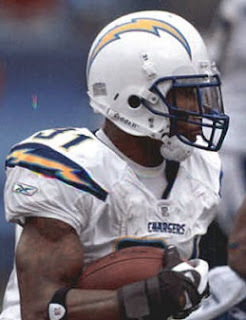 A raw talent with great potential, Cromartie was chosen by the Chargers in the first round of the 2006 NFL draft and split time with CB Drayton Florence as a rookie. He emerged in ’07, showing off outstanding ball-hawking ability in addition to fine speed for coverage. One TD scored on the 109-yard return of a missed field goal vs. Minnesota, a NFL record. Chargers went 11-5 to finish first in the AFC West while leading the NFL in interceptions (30). Won AFC Wild Card playoff over Tennessee Titans (17-6) & AFC Divisional playoff over Indianapolis Colts (28-24). Lost AFC Championship to New England Patriots (21-12). Cromartie had a lesser year in 2008, playing with a hip injury, and intercepted just two passes. There were off-field issues in ’09 and he was traded to the New York Jets in 2010. Cromartie had problems with consistency in his first two years with the Jets but stepped up when top CB Darrelle Revis was injured and garnered Pro Bowl recognition in 2012. Following another Pro Bowl year in 2013, Cromartie moved on to the Arizona Cardinals, again achieved Pro Bowl honors, and returned to the Jets as a free agent in 2015. He had a disappointing year, seeming to have lost speed and failing to intercept a pass for the first time since his rookie year, and was released in the offseason. Overall through 2015, Cromartie has intercepted 31 passes, three of which he returned for touchdowns, with 15 pickoffs and two TDs coming with the Chargers. He also has returned two of his five fumble recoveries for touchdowns and ran back 60 kickoffs for a 23.9-yard average. Cromartie received first-team All-NFL honors once and was named to four Pro Bowls.